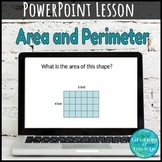 This colorful power point will help your students understand the concept of perimeter. 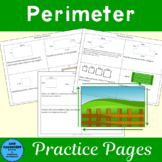 It provides lots of practice and there is a link to a free perimeter worksheet. Area and Perimeter Practice: Roll It, Build It, Solve It! 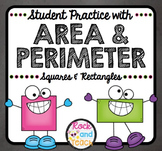 In this activity, students will use cheese it crackers to find the perimeter and area of two different shapes that they create with the crackers. Students will create two different designs on their paper and then label all of the sides. After labeling, students will calculate the area and perimeter. Do your students need test prep practice? 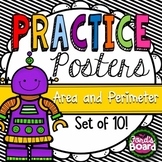 This 6 sheet set is a perfect way for your students to practice their area and perimeter skills in a bubble format. Each sheet has 6 questions (determine the area, perimeter, or the unknown side). Students will bubble in their answers in the box provided. Also included in: Geometry Activities Bundle: Angles, Volume, Surface Area and Perimeter, etc. 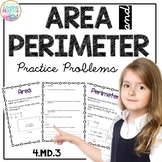 This is a great resource to help students practice partitioning shapes to find their area and perimeter. The practice and exit ticket go along nicely with the power point posted in my store. Practice perimeter by writing your name in block letters and counting up each letters perimeter. Also design your own playground for your school! This can be used as classwork or homework. Students have to determine the perimeter of given shapes, solve word problems about perimeter, and create and solve their own problem involving perimeter. 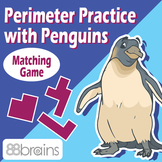 Introduction to perimeter and practice! 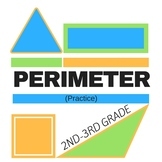 This is a fun way to introduce perimeter. The powerpoint shows what perimeter is, how to find it, and opportunities to find the perimeter.